On this page you will find Brigitte's original paintings at the AT Hun Gallery. Please note that some of the paintings on this page may have been sold meanwhile. Originals cant not be purchased online but Prints or Savannah Prints can. Don't hesitate to contact us for any information: we are here to help. Click on the thumbnails below to see full-size images of the paintings. Please contact us for information on pricing, shipping of original paintings and availability. Brigitte was born and raised in Africa, where she learned how to take advantage of any kind of material on hand. 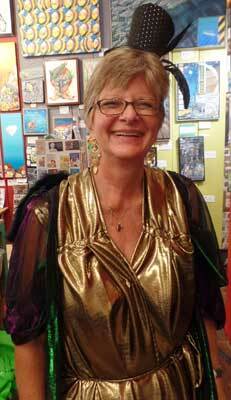 Her art skills cover jewelry, silk painting, macramé, papier mâché, water color and acrylic painting, ink drawings (including old buildings of Savannah and surrounding area)... Her multi-media compositions are romantic pieces of art, full of nostalgia; her artwork is an expression of her mixed African and European roots. Sorry, the works below have found a new home. You can still take a look, and prints are available for most of them on request. Don't hesitate to contact us .